In 2016 SQ & LB Artist Collaboration created an exhibit of silk paintings, photography and research on resilient landscapes of Cape Ann. Research by The Nature Conservancy identified the Cape Ann quarry landscape as a ‘resilient landscape’, that can withstand the impacts of global climate change. The exhibit was showcased at the July 29 – July 31, 2016, Windhover Center for the Performing Arts, Quarry Dance 5, located at Essex County Greenbelt Association’s Kleimola Reservation, in Gloucester, MA. The exhibit was supported by grants from Applied Materials, Essex County Greenbelt Association and Essex County Ecology Center. A 2015 outdoor public art exhibit ‘Climate Change and the Great Marsh’, was conceived by Susan Quateman as a result of attending the 2014 Great Marsh Coalition Symposium, which focused on climate change. Les Bartlett assisted with producing the exhibit and Robert Buchsbaum of Mass Audubon wrote the accompanying text panels. 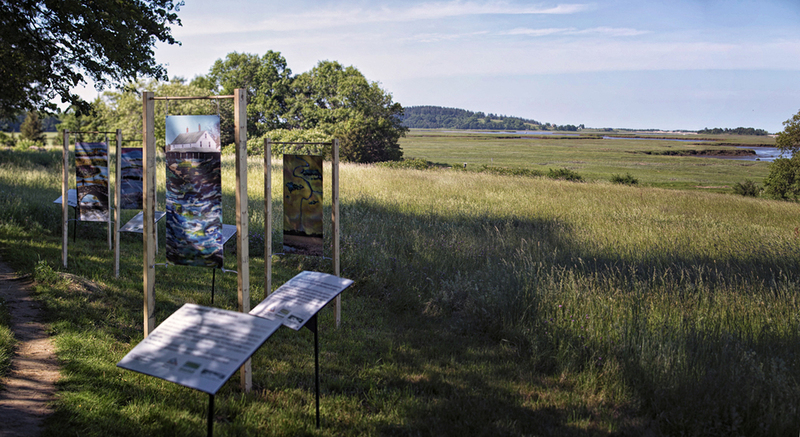 Supported by an Essex Heritage Partnership grant, the exhibit was shown at the Allyn Cox Reservation in Essex, MA; Crane Estate Art Show in Ipswich, MA; Rough Meadows Wildlife Sanctuary in Rowley, MA, and at the 2019 Great Marsh Coalition Symposium. 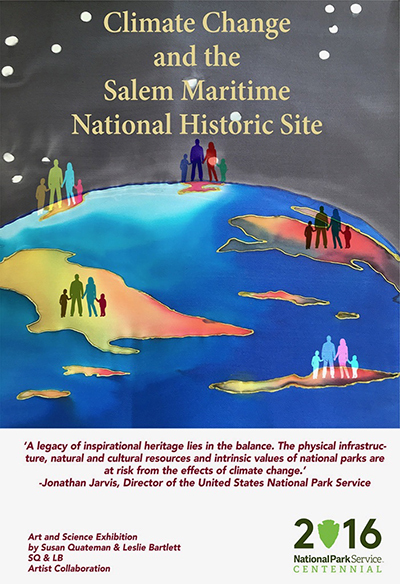 ‘Climate Change and the Salem Maritime National Historic Site’ was an exhibit created for the National Park Service by SQ & LB Artist Collaboration in September - December 2016. It was shown to the public at the Salem Regional Visitor Center. Through silk paintings, photography and National Park Service climate science research we showed how climate change affects all our national parks, including the Salem Maritime National Historic Site. The message of the exhibit was that climate change is real and happening now. The phrase “Climate change respects no boundaries” was written on the bottom of the exhibit in four languages most often heard in Salem – English, Polish, French and Spanish. We could have used a multitude of languages. The impacts of climate change are global. The exhibit was sponsored by the National Park Service, Bicentennial Committee. In May – June 2017 SQ & LB Artist Collaboration exhibited ‘Resilient Landscapes of Marblehead and Cape Ann - Viewed Through the Prism of Ecology and Stories’ at the Marblehead Arts Association. Through silk paintings, photography and stories, we illustrated natural open space areas in Marblehead and Cape Ann that help contribute towards ‘community resilience’. Only through a walking knowledge of our local natural areas can we truly appreciate the importance of conserving and maintaining these important landscapes. Once lost to development they are gone forever. This project marked the beginning of SQ & LB Artist Collaboration. 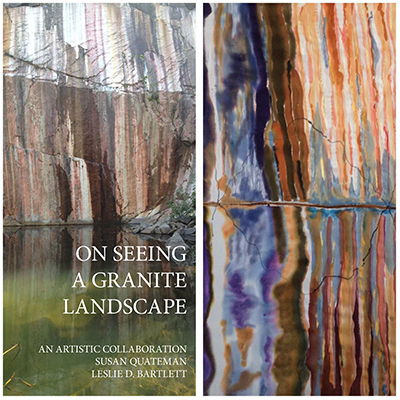 In 2014 SQ and LB Artist Collaboration produced a book, ‘On Seeing A Granite Landscape’, based on the artists’ collaboration of photography and silk paintings of the quarries of Cape Ann. 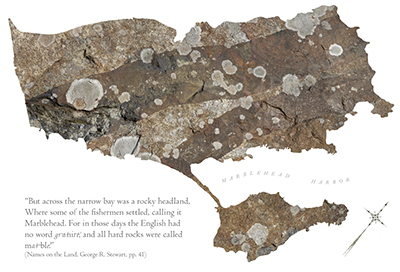 Inspired by Les Bartlett’s photography installation, ‘Chapters on a Quarry Wall,' exhibited at the Cape Ann Museum in 2007, Susan walked with Les through many of the quarries in Gloucester and Rockport. Quarry photography by Les was taken into Susan’s Gloucester silk painting studio, Ten Pound Studio, where she translated them into silk paintings. In their book, Les’ fine​ photography and Susan’s inspired silk paintings are linked together on each page. 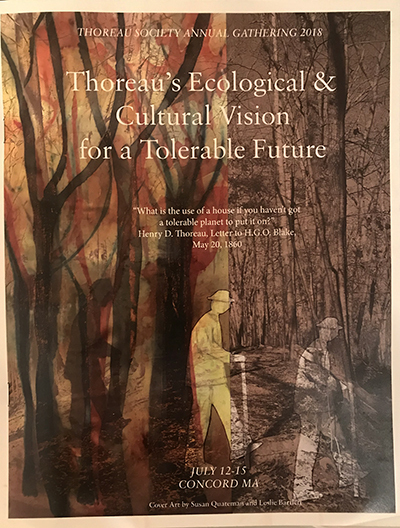 In June 2018 we presented 'All the Rocks We Cannot See: Thoreau and the Changing Landscape of Dogtown,' before the Annual Gathering of the Thoreau Society in Concord, MA. We artistically retraced Thoreau’s 1858 visit to Dogtown, in Gloucester, MA, where he wrote of “the most peculiar scenery…when the moon arose, what had appeared like immense boulders half a mile off in the horizon now looked by contrast no larger than nutshells or burri-nuts against the moon’s disk, and she was the biggest boulder of all”. Our focus was the changing natural landscape of Dogtown, as human interventions, including settlements, logging and farming have repeatedly transformed this landscape over time. Drawing on phenology research by Boston University Professor Richard Primack and local ecologists from Mass Audubon, we combined science and art to examine connections between landscape and climate change in Concord, MA and Dogtown, Gloucester, MA, from Thoreau’s time to the present.